(Manila, Philippines) Cobra Energy Drink, Sunrise Events, Inc. and three-time host location, Lapu-Lapu City in Cebu are now all geared up to hold the biggest and toughest triathlon race that the country has ever experienced, in which only the extraordinary can conquer. The 2014 Cobra Ironman 70.3 is set on August 3, expecting over 2,500 registrants from all over the globe. This year’s race marked history when registration slots were filled up all within 4 hours after the online registration opened. This is by far the biggest Cobra Ironman 70.3 Philippines in terms of registration count. 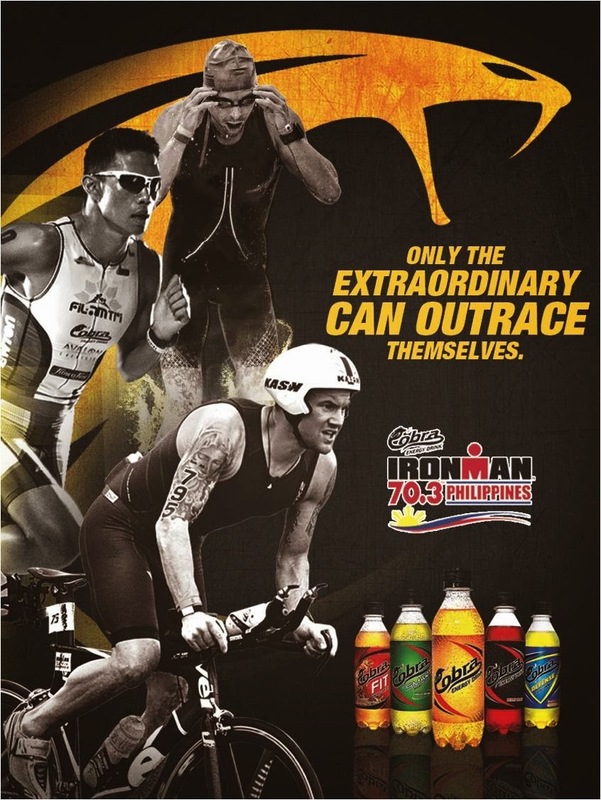 Cobra Energy Drink has been powering up the event for 6 years straight starting in 2009 when the first Cobra Ironman 70.3 was brought to the Philippines. As part of its efforts to promote the sport, Cobra Energy Drink, together with Sunrise Events, held the first Send-Off Expo last July 11-13, where registered triathletes and even just thriving athletes were provided with race-preparation seminars and lectures. This effort goes beyond sustaining the energy needed, but to also fuel up the mind and spirits of the athletes. “We are taking a new philosophy route this year, as we push our hardworking athletes to Be Extraordinary. This is how Cobra Energy Drink sees their challenges – they are not only in competition with other athletes, but more importantly with themselves, outdoing their best race time this year,” explains Abe Cipriano, Asia Brewery AVP for Marketing of Non-Alcoholic Beverages. The training needed for this kind of race takes a lot of effort combined with strong commitment and unyielding perseverance. These athletes’ strict preparation time lasts for months. Similar to the previous Ironman 70.3 events, athletes challenge themselves to reach the finish line for different reasons: some do it to promote a healthy lifestyle, some do it for their advocacies, and there are those who push themselves to test their endurance. As part of Cobra’s ‘Be Extraordinary’ campaign, the brand acclaims the spirit of determination and perseverance of these Cobra Ironman 70.3 athletes who push themselves to be the best that they can be – and become inspiration to thriving athletes and everyday Filipinos. This is how to be extraordinary, by outdoing yourself with every challenge encountered, and for Cobra Ironman 70.3 Philippines, by outracing themselves.